Within a week of its global reveal at the Geneva Motor Show, Lamborghini has shipped an example of its brand new Huracan sportscar to India for multi-city customer events. These spy pictures show a Huracan being unloaded after it arrived at Mumbai airport. The Lamborghini Huracan borrows its design cues from its bigger brother- the Aventador. The car flaunts bold exteriors with smooth silhouette. 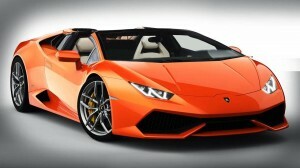 Up front, it gets full LED headlamps, which the Italian manufacturer claims are a first in this class of supercars. The new car sits on 20-inch wheels and is stopped via carbon-ceramic brakes. Angular sills protruding in the front of rear wheel arches are responsible for the car’s lower cooling. A wide outlet runs through the posterior of the car from its rear ends, and provides ventilation to the engine bay. The four line diff user is flanked by twin tail pipes at either ends.